While in Osaka, I got “hooked” on conveyor belt sushi. Get it? Hooked? Sushi? Hooking a fish? Thank you for continuing to read this post. I’ll stop being punny. 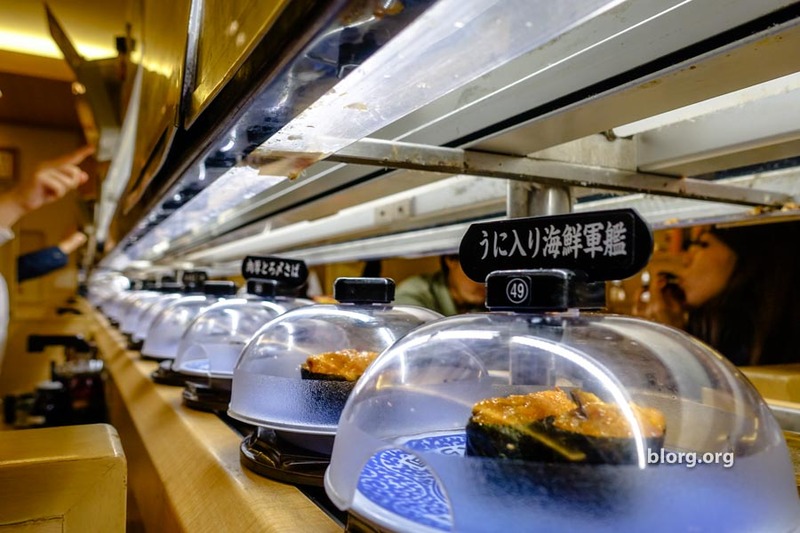 Kura sushi is a very popular conveyor belt sushi chain with locations all over Japan and Los Angeles. They have a very low price, but the price varies depending on location. The lowest price place we found was in Osaka for 100JPY per plate! This was an amazing deal and the quality was surprisingly high! The best way to tell if a restaurant is legitimately good, is seeing a long line of locals waiting to eat there. On a typical night from 6-9pm, you’ll probably wait 60-90 minutes for a table. I ate there several times during my weeklong stay in Osaka because it was good and cheap! When you arrive at Kura Sushi (at this Osaka location), there is a self-ticketing system that is completely in Japanese. I happened to just copy the key presses of the person in front of me and it all made enough sense. “Box” on the ticket just indicates that you prefer a booth rather than bar seating. We ended up with a booth because that’s what the person ahead of us requested…and I copied what they pressed. Once your seated, the sushi just comes by in front of you or you can order from the tablet. The best way to guarantee a “fresher” dish is to order from the tablet. Unfortunately, all there wasn’t an English setting so we just tried our best. Fortunately, the waitress spoke enough English to help us out. We were trying to order drinks but accidentally ordered the check. She explained what each button was for and how to get drinks. Beer was self-serve at 500JPY per glass. We’d have to get it ourselves and use the beer-robot to get a nice draft beverage. If this is how they keep the costs down then I don’t mind it at all. When we finished our plates, we’d bus the table ourselves by placing each plate through the slot under the conveyor belt. For every 5 plates you finish, a game would be triggered on the tablet. If you won the game (completely random), you’d receive a capsule toy. I eat so much and didn’t win. Soooooo much. This is a genius idea. You get the customers to clear most of the table for you while paying them off with a chance to win a cheap toy. Well done.